Visualized records from 1 to 8 - 271 Records found with this search. Cotton. Flared cut. Oval neckline and armhole. 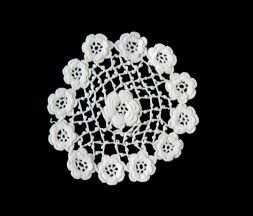 Crochet dicky worked in Irish lace with mercerized cotton thread. The neckline and armhole are trimmed by an embroidered scalloped edge. Maybe used as three-pointed cuff. Irish lace made with crochet hook. 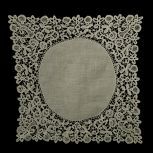 The ornamentation is composed by a following of pansies on a ground of irregular brides with picots and eyelets. Coaster or small setting. 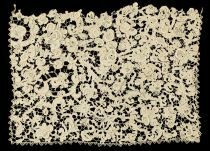 Irish lace made with crochet hook. Mercerized cotton thread. Decoration: Irish lace rosettes with several layers of upraised petals arranged as a crown around the centre. The ground has square meshes composed by small chains with picots. 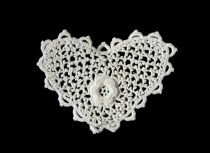 Small heart-shaped setting with an Irish lace rosette at the centre of a ground composed by small arches created by the chain stitch enriched by picots. Mercerized cotton thread. Needle lace, point de gaze. Made in Belgium. Simple needle-made ground. Roses, bellflowers, leaves and small branches and the curved frames are hemmed by groups of threads secured with thin buttonhole stitches, following the point de gaze technique. In the upper part there is a bobbin made ribbon that acts as selvedge.